Welcome to your first steps towards your dog feeling good! For low stress to your dog, I travel to your home for your pets Canine Bowen Therapy session. Improvements can be seen in as few as 3 sessions!!! Canine Bowen Therapy is a non-invasive healthy way to help restore mobility to your canine’s life. Sometimes also benefiting other conditions emotion and physical. What Can Animal Bowen Therapy Help? Animal Bowen therapy is a gentle non-invasive form of therapy; restoring function and movement by treating the body as a whole. Bowen therapy helps to restore balance to the brain-body connection. Using a series of purposeful sequential “rolling” moves over muscle and connective tissue that stimulate the bodies own healing response. Touch of Amelia has been around since 2012. The name Touch of Amelia started with my best friend and soul-mate; my Bernese Mountain Dog named Amelia. She is what has lead me to the career that I am doing today. In trying to find ways to better assist her to live a life of vitality and health, I have discovered that I can also bring these skills to your animal family! Amelia has her paw print on everything that I do. I started by focusing on a better way to communicate with your animal companions, and have grown to include enriching their lives and health through the use of Animal Bowen Therapy. 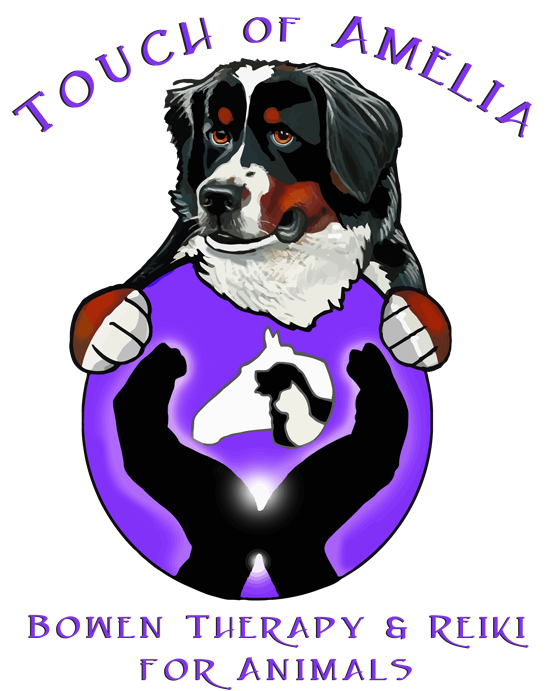 I specifically specialize in Dog Bowen Therapy (Canine Bowen therapy) and other companion animals, but have worked with animals of all sizes using Animal Reiki and Animal Bowen therapy. I believe all animals have the right to feel good both physically and mentally. I have seen incredible changes in the senior pets I have worked with; newly restored vitality, and mobility as well as faster recovery from recent muscle strains and sprains. I love what I do! I would love to help your animal companion find the same restored health and mobility.